14 Sep Heavy cattle and WA showing strength. 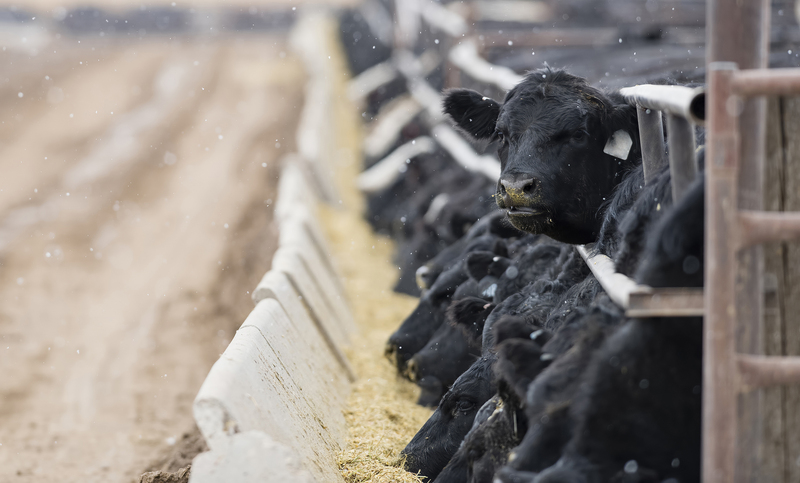 Despite more upside for the Eastern Young Cattle Indicator (EYCI) it, along with restocker markets, are still languishing behind last year’s levels. The same can’t be said for finished cattle markets, which have moved well ahead of the same time last year. 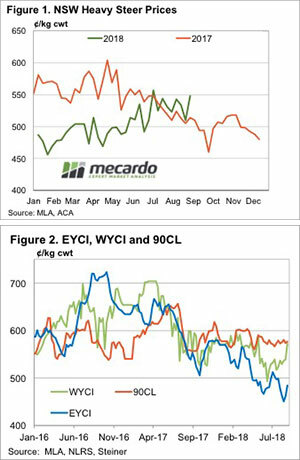 The EYCI managed a 4.5¢ rise this week to 488.5¢/kg cwt thanks to another week of tight supply. EYCI yardings were at just 10,403 on Thursday, with Roma contributing 23% of the numbers. There was a bit more rain about in NSW which obviously helped keep sellers optimistic and cattle at home. This time last year Heavy Steer prices were on the decline. Dry weather saw plenty of cattle coming to the market. This year, the lack of feed over the last 6 to 12 months is seeing fewer grassfed cattle available and higher Heavy Steer prices despite the dry (Figure 1). The NSW Heavy Steer has only been higher in one week since July last year. The same goes for the Victorian indicator, although it is slightly stronger at 556¢/kg cwt. The WA Young Cattle Indicator (WYCI) jumped higher this week, with Figure 2 showing it is now matching the 90CL Frozen Cow indicator. The WYCI is now strongly outstripping its east coast counterpart, with more grass and cheaper feed grain adding demand to tight supply. Export prices have been remarkably steady for the last 12 months, even during the drought-induced heavier supply. This is good news for continued support for prices. With some more rain forecast for some key areas of the NSW slopes, it’s hard to see increases in supply or decreases in price. As with recent falls, it won’t be drought-breaking, but it will at least provide some hope that it can rain and might again. Normal seasonality has been thrown out the window. This year it’s more of a case of where fair pricing is, and when the rain comes to take values back there.